Team San Francisco was born from the Gay Games vision begun by Dr. Tom Waddell and others in 1982 and we have had a proud, productive relationship with the Gay Games throughout our history. We celebrate and honor the foundation of so many LGBT sports and cultural organizations before and since the founding of the Gay Games and the inclusive ability for all to come together every four years at the Gay Games. We support the successful exploration and development of Continental Outgames in underrepresented and politically repressive areas and endorse those continued efforts. Such events assist in the development of LGBT sports and athletes around the world in the intervening years, and can significantly contribute to the successful coming together of these athletes once every four years at the Gay Games. We believe that the World Outgames, however, have created a dispersal of athlete and sponsor support that threatens the unity and vitality of the LGBT sports global community. Team San Francisco does not have the resources to support promotion of future World Outgames without a serious dilution of our Gay Games efforts. 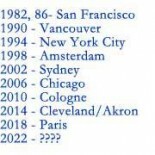 Team San Francisco therefore proposes and recommends that the long established and internationally recognized Gay Games be the only quadrennial global LGBT multi-sport and cultural event beginning in 2010. We shall work diligently to make those games as successful as possible and focus our efforts on bringing athletes and cultural participants together for the Gay Games. Team San Francisco also recommends a restoration of the former EuroGames calendar to three continental events in every four year period, and we thank EGLSF for allowing limited participation of non-Europeans in the EuroGames. We also recommend the continued development of Continental Outgames in Australasia, Eastern Europe, South America, Asia and Africa. Where and when possible, we shall work diligently to make such events as successful as possible within our sphere of influence. Welcome supporters of the Gay Games!